“They’re building these big, new tech hubs,” she said, describing the tech building boom south of Union Square that is threatening the historic neighborhood, driving up speculation and demolition. “And in a trade-off, the Strand and a few other buildings along Broadway are now being calendared for landmarking.” But the bookstore and building owner Nancy Bass has not been part of that decision. She didn’t receive the LPC’s draft designation report until after Thanksgiving, giving the Strand little time to prepare for the public hearing on December 4. 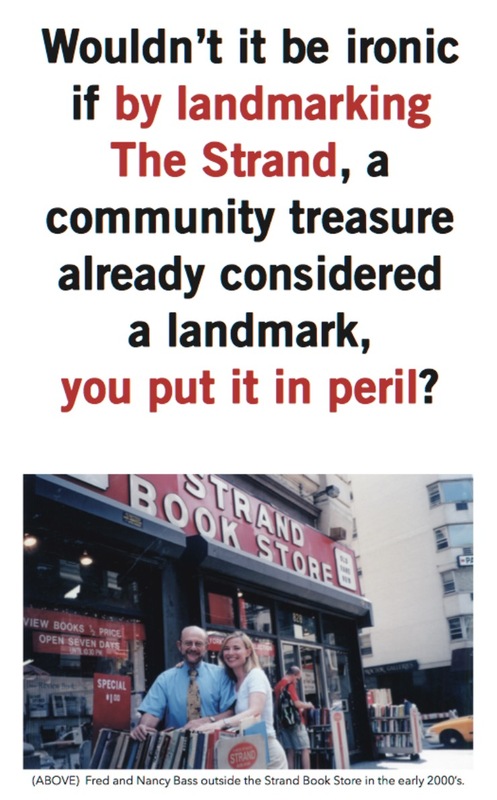 Below is the full text of the Strand’s press release, with information about the public hearing and a request for help. I’m writing today to ask for your support. The Strand’s building is currently calendared for landmarking by the city. 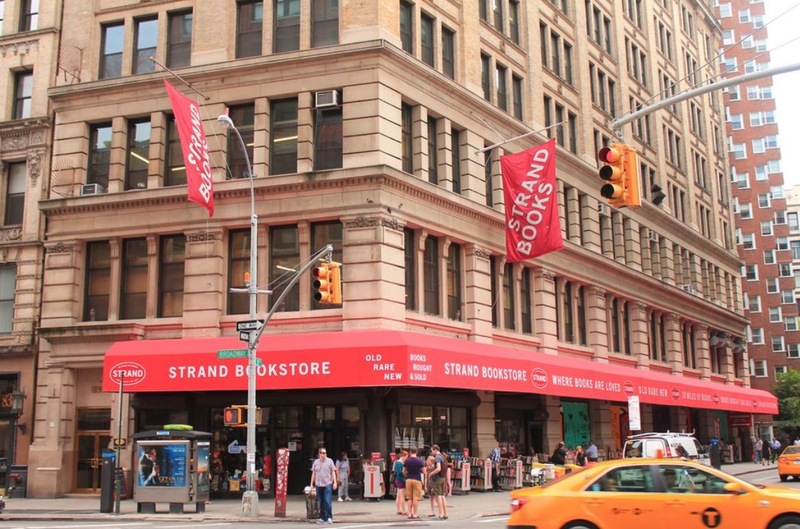 The Strand currently runs on thin margins as a bookseller and retailer in New York City, fighting to survive in the era of Amazon. We have over 230 employees — most whom are unionized — and unlike large online retailers (like Amazon), have never asked or received tax breaks or other economic assistance to insure business profitability. All this designation will do is cost us with bureaucracy in time, frustration, money and uncertainty. We will be forced to wait for approvals and debate what is the right thing to do– both inside and outside of the store for changes like putting in a coffee shop, repairs from a flood or fire, etc. We need to have the flexibility to change with the needs of our customers and community. Nancy’s family worked for six decades to be able to buy this building and is dedicated to continuing the Bass’s 91 year legacy forward. The building is already overbuilt — with no air rights — and at no risk for becoming a high rise, glass office building, hotel or luxury apartment. Nancy just wants to insure the security of the Strand, giving her children the opportunity to become 4th generation owners.